A Lions fan learns about fatherhood from Calvin Johnson Sr.
Editor's Note: Tim Alberta is a chief political correspondent for the National Review, a Lions fan, and father of two boys, Abraham and Lewis. He shared this lesson on fatherhood that he learned from Megatron's father. I folded up the jersey on a whim, slid a black Sharpie marker through its creases, and shoved the package into my cargo pocket. Football players are typically inaccessible for autographs, what with the security protocols and stadium designs that keep them distanced from the stands. I knew that. But I also knew that I wouldn’t get a better shot than this: My beloved Detroit Lions were visiting Washington, D.C., my adopted hometown, for a preseason game, and I had procured great seats—second row, 35-yard-line, behind the Lions’ bench—for $50. The worst part about preseason football is that the league's marquee players see limited snaps, and some don’t dress at all. Yet there’s an upside to these third-string showdowns: Ticket prices plummet on the after-sale market, giving cash-strapped fans the chance to watch a game from seats they otherwise could never afford. And who knows: Maybe, just maybe, one of those inactive superstars comes strolling by, close enough to slap a hand or snap a selfie—or even sign an autograph. These visions were dancing in my head on a steamy Thursday evening last August as I arrived at FedExField in Maryland. The last thing I did before leaving home, after stuffing a size 2T Calvin Johnson jersey into my pocket, was kiss its owner: Abraham. I had given it to my son at his first Christmas eight months prior and draped him in it whenever possible, including at his first birthday party a few weeks before the Lions came to town. His nursery already paid homage to the legendary Lion of my youth: a framed photograph of Barry Sanders—whose early retirement in 1999 shattered my 13-year-old soul—hung above the changing table. Now I was determined to add a newer, more relevant decoration to Abraham’s room: an autographed Calvin Johnson jersey. I wanted to bring the lad along, baptize him into a life of Lions-related disappointments, but my wife squinted with an expression that said forget about it. He was too young, it would be too loud, and besides, there was heavy rain in the forecast. I went with my friend Bill instead. When we found our seats—45 minutes before kickoff, the stadium nearly empty—there was good news and bad. I had just read on Twitter that Megatron was deactivated for the game, meaning he’d be pacing the sidelines and perhaps more available for autographing. Yet the seats themselves, while as close to the field as possible, were still a skinny-post away from the Lions’ bench. None of the players, I realized, would be wandering all the way over to us. 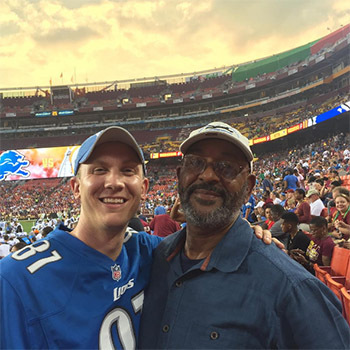 The writer and Calvin Johnson Sr. at Detroit's 2015 preseason game at Washington. My football team hasn’t been to a Super Bowl, we have just one playoff victory in the last 58 years. But Calvin Johnson breaking Jerry Rice’s record gave Lions fans a feeling of exaltation. My football team hasn’t been to a Super Bowl, we have just one playoff victory in the last 58 years. But Calvin Johnson breaking Jerry Rice’s record gave Lions fans a feeling of exaltation. More than a decade after No. 20 walked away—compounding the sense of tragedy and doom surrounding the franchise—No. 81 had taken his place as Detroit’s iconic superstar. My earliest NFL memories were of my dad and brothers jumping and shrieking as Barry broke a fourth or fifth tackle en route to a long touchdown run; he always provided reliable optimism and excitement even as the Lions let us down. Calvin would do the same for my son. I did the math: Megatron was 28 when Abraham was born, meaning his first memories would be of the legendary Calvin Johnson, in the twilight of his career, still leaping over triple-coverage and coming down with unthinkable catches. He would be the bridge between a generation of Lions fans. And now, I was sitting next to his dad. “I am,” he nodded quietly. Then I got curious. “What brings you here tonight?” I asked him. Megatron rarely stepped on the field in exhibition games anymore; the risk of injury to the league’s premier receiver far outweighed the importance of a few reps that he didn’t really need. Foolishly, I found myself pitying the Johnsons. Had they traveled all the way to Washington thinking Calvin would play? “We come to all of his games,” Calvin Sr. told me. Lions fans had long known that in an era of divas and drug users and domestic violators, Calvin Johnson was a gentleman superstar. Now, chatting with his father, I understood why. He offered another smile, but this time shook his head in a gentle rebuke. “Calvin plays football,” his father said firmly. “If that’s all he wanted to do with his life, he wouldn’t have gone to Georgia Tech.” I got his point: Georgia Tech is renowned for academics, not athletics; had the younger Johnson cared only about an NFL career he would have forgone the construction management program at Georgia Tech and chosen another school. “Do you want to know about my other children?” Calvin Sr. asked. He was beaming now. It turns out Megatron isn’t the family wunderkind. His older sister earned a Ph.D. in biomedical science and was being published in medical journals. His younger brother was about to earn a degree from Morehouse School of Medicine. His younger sister was on a scholarship at Georgia State. These academic successes, Calvin Sr. explained, owed to their mother, Dr. Arica Johnson, who holds a doctorate in education and is an administrator with the Atlanta public schools. I looked over at Calvin’s mother. She shrugged, smiled, and then returned her gaze to the gridiron. “That’s one impressive family you’ve got,” I stammered, searching for an adequate compliment. I laughed too, recalling the profiles I'd read about Calvin's father working as a freight conductor for Norfolk Southern Railway, hauling shipments back and forth through central Georgia for the past three decades. Suddenly it all made sense. Lions fans had long known that in an era of divas and drug users and domestic violators, Calvin Johnson was a gentleman superstar—a once-in-a-generation talent, yes, but a better person and teammate. Now, chatting with is father, I understood why. What made No. 81 so special wasn’t just the physical supremacy he was born with; it was the humility, work ethic and decency he and his siblings were taught. The NFL’s best receiver was dressed in full jersey and pads that night, joining huddles and catching balls despite knowing he wouldn’t play. And his parents sat in the stands despite knowing the same. The sky had turned a beautifully combustible blend of orange and purple and black. Rain began to blanket FedExField, and with halftime approaching, many of the spectators scampered toward the pavilion. Bill and I did the same. As we slid into the aisle and began our ascent, I glanced back over my left shoulder. The Johnsons had not moved. Both had pulled ponchos over themselves and were watching the game. The parents of a multimillionaire NFL icon—who wasn’t even playing tonight—weren’t going to miss any of his team’s game. Just be there, I thought to myself. It wasn’t until halftime, as we stood sipping beers beneath the burgundy-and-gold awning, that it hit me: the jersey. I had been so engrossed in conversation with Calvin Johnson’s father that my mission of getting an autograph from Calvin Johnson had gone sideways. Frantic, I made my way back to the seats, hoping and praying that the Johnsons were still there. They hadn’t moved. We saddled up beside them once more, exchanged greetings, and I took deep breaths to let my heart rate slow. A quarter of the game went by in silence. The rain had turned to mist, Kirk Cousins (my fellow Spartan) had replaced a battered Robert Griffin III, and the Johnsons were enjoying the game without interruption from their fan-boy neighbor. I didn’t want to intrude anymore. But when the third quarter ended, I cleared my throat. Pulling the tiny square of fabric from my pocket, I told Calvin Sr. my scheme to get his son’s autograph and hang the jersey in my son’s room. I had barely finished when he interrupted: “Want me to give it to him?” Before I could register what he’d said, he corrected himself: Actually, it was wet outside and he wouldn’t want to be responsible for my property getting damaged or lost. I told him that I understood. 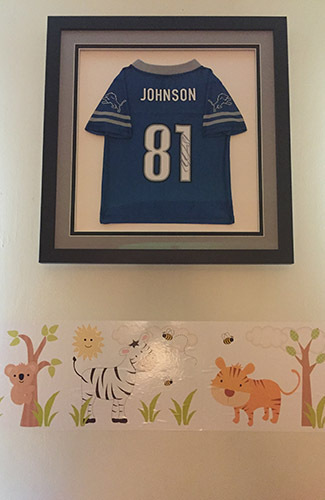 The autographed Calvin Johnson jersey now hangs in Alberta's sons' room. The next day I did just that. Into a certified-mail envelope I layered the jersey, a photo of Abraham wearing it, and a note expressing my appreciation. I had a $10 bill to cover their return expenses, but was dismayed after sealing and shipping the package to discover it was still in my wallet. Megatron made $20 million in 2015, but that wasn’t the point; I didn’t want to be rude when the family had shown me such generosity. Two weeks later—and two days before the Lions kicked off the season with a loss in San Diego—a package arrived. Its contents: an autographed Calvin Johnson jersey, and an autographed photo of Abraham wearing his Calvin Johnson jersey. Both are displayed in his nursery today. I was dazed when Barry Sanders walked away from the NFL at 31 and in the prime of his career. Calvin Johnson will turn 31 this fall, and despite nagging injuries that slowed him the last two years, he would still be among the game’s elite receivers. Yet when the news broke in January that he was considering retirement—and when he went through with it in March—it made perfect sense to me. If I learned one thing from talking to his father that night, it was this: The man known as Megatron wasn’t brought up just to be a football player. He was imbued with a greater perspective and purpose. His goals and achievements were meant to transcend lofty statistics and impossible touchdown grabs. My sons will never watch No. 81 play for the Lions. But they will know his legend and his story. And unlike Barry Sanders, Calvin Johnson’s presence in their rooms—and in their imaginations—will never be tainted by regret or disappointment. Abraham has a little brother now. We thought about naming him Calvin; my wife actually loved that idea. But I think Calvin Johnson Sr. would have disapproved of christening my son after a football player. So we named him Lewis, after C.S. Lewis, my favorite writer. He was born on April 28 at 9:13 p.m. After he was examined, cleaned and swaddled, I cradled him in my arms and walked over to the television in our delivery room. In that inaugural father-son moment, we watched the Detroit Lions select Taylor Decker, an offensive tackle, in the first round of the NFL Draft. I grumbled aloud about picking an Ohio State product, and my phone lit up with messages debating whether we should have drafted for defense. It was Lewis’s first taste of being a Lions fan. And I was there for it.